Well ingame my character is Faelarin (or Fae). I am a Former Mage Class Leader and Officer of <Severance> on Deathwing and have been playing Mage as my main since WoW release in 2004. As you can see there is no Arcane Barrage or Slow in the spec. This is because they're just not needed. Arcane Barrage will actually drop your dps when used because of the GCD (global cooldown) that it causes. Slow is not in the spec either, this is because as of patch 3.3.3 it is no longer required to have the "Slow" spell debuff on target for Torment the Weak to take effect. This means that tanks now apply a debuff that allows you to take advantage of TTW. However in the case of Molten-WoW, only certain debuffs actually proc TTW properly, the main one being a Death Knights Icy Touch. Because most raids have a Death Knight, it is not required to have Slow in the spec. Those 2 points which most people place in these two talents have been places into Arcane Stability to allow for nearly no pushback with raid buffs for arcane missiles (namely Concentration Aura which gives 35%). It is also possible to remove 1 additional point from Student of the Mind to cap reduced pushback with Conc. Aura. There are 2 more problems with Arcane on molten, as most people know, this is a subpar spec for dps. This is mainly due to a scaling bug with Arcane Blast. At around 2800-2900 spellpower you will notice that your Arcane Blast damage does not increase as much as it should with further spell power increases. A good way to test this and see for yourself as i have is to use DFO and just spam Arcane Blast. You'll notice that the damage on Arcane Blast does not increase by as rapidly as it should. The second bug is a visual and actual bug depending on your current haste rating. At around 1000 haste, you'll begin to have a visual bug on Arcane Missiles where it only fires 4 instead of 5 times. However this is only visual. Arcane still does exactly what it's supposed to at lower gear levels. I know what everyone's thinking... "wtf frost dps mage?" Yes this is a viable spec, however it is not viable on molten due to a bug with Deep Freeze (it does not do damage on bosses like it is supposed to, tested as of December 23 2013). Unfortunate for me as this is my favourite spec. It's faster than arcane with more procs to manages. Sadly due to molten bugs, useless spec. Now assuming this spec was viable on molten. The talent set up can be modified quite a bit, the spec posted here is the top dps version possible with Ice Barrier. Frost Dps will not be mentioned further throughout the guide because of molten bugs, PM me in game if you want more info for the funs xD. TTW Fire on molten works perfectly fine as long as you fulfill the requirements for Torment The Weak. This generally means having a DK. With a DK this scales almost exactly as it does on Retail with the exception of ignite. (Described in a later post by Chocohole (Lucideto)). The point in master of elements is a free point which can be placed based on needs. Most commonly changed for Blast Wave which can provide utility in raids just like the shamans thunderstorm or druids typhoon. There are times when you should not be prioritizing LB and times when you should be. These vary drastically based on the RNG you get during fights. Sometimes keeping LB on target will give you more Hotstreak procs and sometimes it will cause you to lose DPS because of the GCD is causes. Is it worth cancelling a cast to ensure a hotstreak proc? Rarely. If you are about to move then yes. If not, no. Stopping casts effectively drops your dps and causes extra GCDs to get instant spells off. Generally you want to clip your cast times with instant spells. The uses of these 2 potions varies by spec and gearing. For a crit stacker generally the potion of speed will be more beneficial, while for a SP stacker, the potion of wild magic will be more beneficial. In general both should be carried, but as mages we're all lazy and generally don't even carry either of them. Leatherworking: Effectively 46 Spell Power: Fur Lining - Spell Power (76 Spell power) replaces the standard 30 Spell power enchant. **SITUATIONAL: Tuskarr's Vitality, This enchant will actually give more dps during certain fights, namely high movement fights because it allows for more time to cast. It also gives extra survival which should not be overlooked either (dying = 0 dps). *NOTE* This is without taking JC dragonÔÇÖs eyes into consideration. If you have JC. Replace 3 would be Red/Yellow gems respectively for the DragonÔÇÖs Eye version. This means that if you are SP gemming you use Runed DragonÔÇÖs Eye x3 while Crit gemming you use Smooth DragonÔÇÖs Eye x3. Trinket 2: MuradinÔÇÖs Spyglass OR Charred Twilight Scale (Heroic), normal CTS is not better than Spyglass heroic. The FFB specs are more complex with CDs overall because you have more choices. These choices will generally rely on whatÔÇÖs need for each encounter. The use of CDs on FFB specs also relies heavily on gearing and gemming. For example a CS FFB mage can chain haste CDs. This means you can for example use Icy Veins at the start of a fight, activate Cold Snap and use Icy Veins again, and the use Mirror Images and Combustion during Bloodlust. (If troll racial, ad d that into the chain). Or a CS FFB mage use all the CDs during Bloodlust for more burst and then use a 2nd IV after. There are many ways to work around CDs with FFB mages which allows you to manipulate your DPS further based on the raids needs. Do you need opening burst or end fight burst or just need to push more damage out at a certain time? Based on this you need to manage your CDs properly. Mirror Images is one of the most important CDs for a mage once they get 4p T10, this is because of the 30 second 18% damage buff. Another key part of Mirror Images is its ÔÇ£aggro wipeÔÇØ system it has built in. When using Mirror Images all threat you have temporarily equals 0. However you retain all threat and built threat during its activation. This means that bursting with Mirror Images can cause you to pull aggro after the burst. Mirror Images can also be used defensively in case you do pull aggro before using it because of its temporary aggro wipe. This can therefore be difficult to decide on when to use though generally does not have any problems. One major example of when to not use Mirror Images at the start of a fight to burst is if you need to ensure you obtain bite from Blood Queen LanaÔÇÖthel. If Mirror Images is used to increase damage and threat just to ensure you obtain bite, you will actually cause someone else to get the bite due to the simulated 0 threat. This is why in the Macros below, Mirror Images is NOT added into any of the CD macros. MikeÔÇÖs Scrolling Combat Text ÔÇô If you want cleaner notifications of damage dealt per spell. If scorch is fading the same time as LB, which one do I refresh? Cast scorch and clip it with LB so you don't cause extra downtime. If LB falls off, do I wait until I have a 'Hot Streak' proc before I refresh it to keep ignite stacked up high? That's common rumour to keep "high ignite", but there is not actual benefit from "rolling" ignite. Ignite works by having a damage bank (made of those 40% of critical damage). When Ignite ticks, it's damage bank is decreased by 50%. If you do a critical FFB, damage bank of actual ignite on the target is increased by 40% of your FFB's damage. The actual high ignites are "stacked" because the critical strikes are done faster than each 2 seconds, so ignite hasn't ticked even once -damage bank is only increased till you do not crit for 2 seconds. Of course the higher uptime of ignite - the higher dps is, but the reason is not the "rolling" of ignite but simply if its uptime is high, it means you had a lot of crits. Depending on how much you're critting, how well you know the your cast times and how well you manage your procs will determine when to apply LB. If LB will not cause a double tick of hotstreak, then apply it, but if you apply it right away and the explosion makes you waste a hotstreak because it procs before you have time to use a previous one, then you should delay it slightly, this is because the damage bank of ignite will increase more by having more procs as well since you get more crits with more procs. So as an example, Living Bomb ticks over 12 seconds and causes about a 1.1-1.3second GCD in general. This means that you have give or take 10.8 seconds untill it explodes to cast FFB/Fireball. This will get you 4 or 5 casts depending on procs you get during the casts. If on the last FFB/Fireball you happen to get a Hotstreak proc, and crit with 2 previous spells. Then the 3rd spell, if not clipped with hotstreak, will most likely waste a hotstreak because it will get the hotstreak proc again due to LB. (Wasted Hotstreak). There are ways to avoid this and manipulate it so that you can actually chain 3 Hotstreak procs in a row but it is important to be use to your cast times. Example of chain hotstreaks (assuming all crits for this to happen, also works with TTW): apply LB, FFB, FFB, FFB, FFB (clipped with HS), FFB (Clipped with HS), FFB (Clipped with HS). The reason this works is because Hotstreak does not proc until the spell hits the targets hitbox, rather than at casting. So your first 2 FFBs give a hotstreak, then that wont be overrode until 2 more crits hit the target, so if you clip your 4th FFB before it hits the target, then the 4th FFB will give you a new hotstreak which you use on the next FFB. When the 5th FFB hits, LB should explode to give another hotstreak which you can use to immediately clip another FFB. hey really good guide. well thought out and very detailed. But the links for the talent trees don't seem to work for me. Can you repost them or something? Hello thanks for your guide dude.it was amazing. Would you tell about the glyphs of frost talent please? why is the rotface hc trinket better then sindy hc trinket? You're probably looking at the Arcane bis lists. It is so because arcane has no dots that can proc the sp effect of potnl. It renders potnl almost utterly useless. TTW is the superior mage spec. FFB is obsolete in this patch unless you want it for the stronger Blizzard crits, or if you intend to spec Cold Snap so you can game a fight's mechanics via double Ice Block (Sindy for instance). I am really curious as to why TTW is superior. I haven't played in a year and when I played FFB was stronger overall usually due to Shatter working on LK alone. Could you explain thoroughly why TTW is better now? what is the haste needed here without black magic and 63sp instead? I would just have to add +250 haste making it 1640haste? So now that deep does indeed do damage on bosses frsot is viable again? Just check out some ranking lists :) Even if they are not 100% accurate for the private server, they are giving you a guideline. 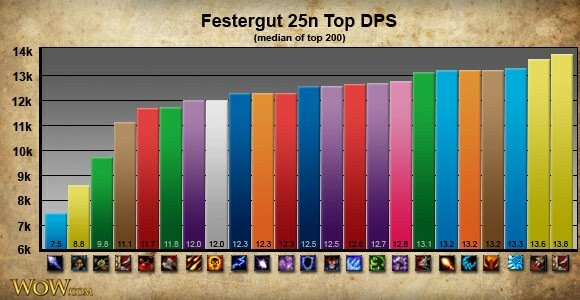 Sadly Frost dps is always dooooown at the bottom (if not excluded). Now tell me is there a Macro for Scorch and LB or any spell and LB to avoid GCD or i must cast one by one ? Also keep an eye if the warlocks can apply the buff either (improved shadowbolt), because then you shouldn't have to worry about casting Scorch.